Stonework is classic and classy. Integrating stonework into your landscape ensures that you have a beautiful, long-lasting design that fits seamlessly with all components of your space. If you’re looking to build a flagstone patio, you can count on the landscaping team here at Jeff Fuller. Perhaps you’re looking to put in a new pathway weaving from your front lawn to your backyard. 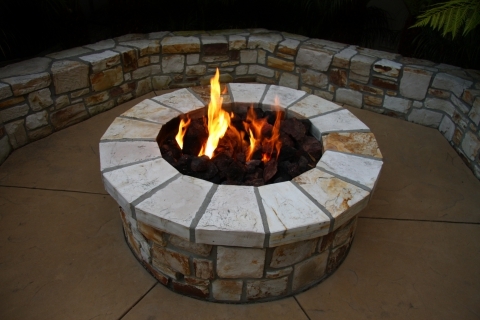 Or if you’re looking to build a stone fireplace in your landscape, we can do that too. No matter the stonework you desire, we’re the landscaping firm to call. We provide both landscape designing and landscape builds. Let our landscape architects formulate the perfect design to suit your desires, and let our team of elite landscapers implement the build of your dreams. From start to finish, Jeff Fuller Designs is here to connect you with the picturesque landscape of your dreams. Here at Jeff Fuller Designs, your Jackson- and Memphis-area landscape design and build firm, we understand how valuable your landscape is to your property. It’s the first things guests see as they approach your home. It’s the first thing a potential buyer will see as they pull up to the curb. It’s the space that your family enjoys as they bask in the rays of summer, or as they enjoy s’mores around a campfire in winter. Regardless of how you choose to utilize your landscape, we understand its worth. That’s the product we provide: Value. Get in touch with us to learn more about our landscaping services or to schedule an appointment!